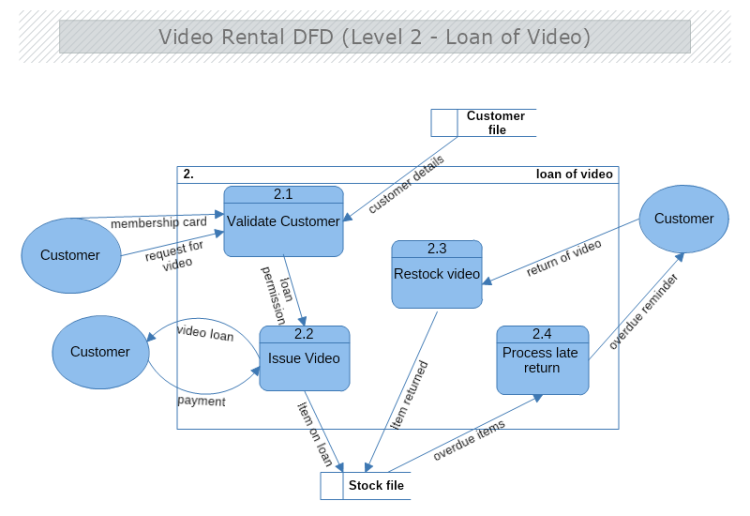 This is a level 2 Data Flow Diagram illustrating a video rental system. This level of DFD concentrates in a greater detail of one of the system’s processes and the kind of data flowing between its main sub-processes and the external entities it is directly connected to. In the shown example this includes the process of customer validation, video files issuing, restocking videos, and the process of late return along with customers, the customer file database, and stock file database. The example is suitable for displaying the data flow information within any kind of item-loan services. Download this free template and modify it with MyDraw so it meets your needs and requirements.